Earlier this week I was at Kinokuniya looking for some books that will help me teach Little DinoEgg to control his anger and temper when I come across this book; Have You Filled a Bucket Today? I read it through before deciding to get this for Little DinoEgg. I know this will help in to be a better person and in a way control his outburst of temper, actions. To show some love, thoughtfulness, gentleness, respects to others. At the back of the book, it says "Through sweet, simple prose and vivid illustrations, this heartwarming book encourage positive behaviour as children see how very easy and rewarding it is to express kindness, appreciation and love on a daily basis." A little bit about the book. We all carry an invisible bucket that contains our feelings. When our bucket is full, we feel great. When our bucket is empty, we feel sad. 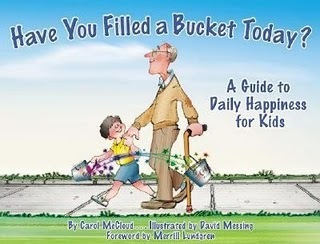 A bucket filler is someone who says or does nice things for other people. By doing this, they are filling other people's buckets and filling their own bucket at the same time. The cheerful bucket with its rainbow colored hearts and stars attracts Little DinoEgg's attention. He sat there quietly listening to me reading, only interrupted me once (when we got to the bus driver), which is good coz he always interrupts me when I am reading or he will be distracted by something else or the picture on next page. I guess he really like this book coz the next day when its Bedtime Reading, he get this book out for me to read again (he only have a handful of books that he fancy). Now every morning after we usual hugs n kisses before I head off to work, I will tell him "Remember to fill some one's bucket today alright?" And when I reach home I will ask him "Did you fill some one's bucket today?" " Who's bucket?" He will proceed to tell me what he has done or who has emptied his bucket by dipping into it etc etc. A chat with his teacher yesterday gives me some pleasant news. She says he no longer shouts or scream or protest loudly when some one is doing things that he does not like, snatched his things, teacher punish him etc Instead he will be calm and behave himself. Well, is this the work of the Invisible Bucket? I hope it is but we still have a long way to go to determine it. As of now, I am happy that he is no longer showing those bad attitude n temper tantrums. Hope he keeps it up.